We’ve had our fair share of great & not-so-great experiences with contractors & have been able to dial-in a working-system we’ve really been happy with! Tune in to today’s episode to learn 8 of our best tips for working with contractors to reduce your learning curve, & make your life just a little bit easier during your projects. 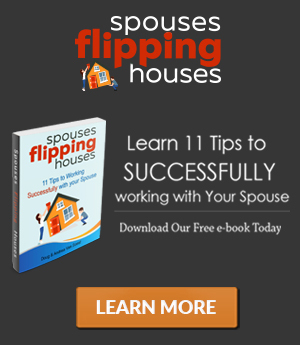 Doug: Welcome to the Spouses Flipping Houses podcast. We are on Episode 32, and across the table from me is my lovely wife Andrea. Hello. 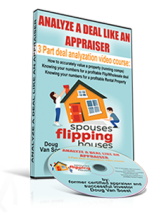 Doug: Today we’ve got a great topic that is pretty important if you’re going to flip houses, pretty essential, and it is working with contractors. Andrea: Yes, we have worked with a lot of different contractors over the last eight years, and we’ve had some really great experiences and some really not so great experiences. And so through all of that, we sort of dialed down our system for working with contractors, and it really has been dialed down over the last I would say eight months or so. Doug: Yeah definitely. It’s changed and morphed, how we’ve worked with contractors has morphed over the years, and we’ve kind of packaged it into this system now that we’re using that, at least for the time being, we’re really, really pleased with. Doug: So in this podcast, we’ve got eight killer tips for you for working with contractors. And it’s really a lot of content here, so we’re going to dive right into it. Doug: It’s funny how we flip houses for a living, but do you have any training in construction or anything like that? Any kind of formal background in…? Andrea: The only background that I have, which I feel like actually has served me well, and I feel like I have a good understanding of the construction process, is the fact that my dad built one of the houses that we lived in growing up. And I would go with him to the jobsite all the time and just watch, and sometimes he’d have me helping to mud the drywall. Doug: In your mind, you built a house. Andrea: in my mind I built a house. I basically built a house as a child. Doug: Well I’m glad. Maybe that gave you the confidence to take this on because I have zero, zilch, zip background, I should say, in construction. No knowledge whatsoever, did not work in construction growing up. I can paint a wall, and I can hang a picture on the wall, and Google something when I need to change out a toilet or whatever in the house, but zero background in any of this. And yet you and I landed on rehabbing houses for a living, so let that be encouragement to any of you out there who are like us and don’t have any real formal training or experience much at all. You can do it. It can be done. Andrea: And even though you have no formal training, it is something that you have always loved, maybe back from your Lego days as a child. I don’t know, but you have always loved this sort of thing. Andrea: Doug really wanted to be an architect growing up, and I always wanted to be an interior designer. I’ve loved interior design for as long as I can remember. I was constantly changing my parent’s house around and even painting without permission, things like that. Doug: Tell that story! You painted your house while your parents were out of town I think, right? Andrea: No that’s another story about some friends and I who accidentally knocked over a brick pillar, and we rebricked and mortared the pillar all by ourselves while they were out of town. Doug: Didn’t show at all. Andrea: No, they could tell the very second they drove up that something was very, very wrong. Doug: It kind of looked like the Leaning Tower of Pisa, tilted. I remember seeing that, anyway. Andrea: Yeah, but I think— actually I better go back and ask— I think I got permission, not really sure. There was an old boyfriend coming back to town to visit, and I just thought their house needed a facelift before he came over. Andrea: Our house, my house, their house. Sure, whatever. So yeah the trim and the front door were like a dark brown. It was fine, you know. But I just thought it would look better blue, so I painted it blue. The problem being though that the roof peaked on the sides, so I only painted as far as I could reach, so the front of the house looked fantastic just don’t go around the side or back. Doug: So as long as you didn’t bring the boyfriend around the side or the back, you’re good. Andrea: And he didn’t even end up coming to town after all that. Doug: Well I’m glad he didn’t. Maybe that plays a role in how we ended up together. I don’t know. I forgot about that; that’s funny story. Andrea: But anyways, back to what I was saying. Both of us, from an early age, loved this whole concept of kind of renovating a home in some fashion, whether it be through design or you, the construction/architectural side. Doug: Layout of things and just creating something. That was my draw to it and yours as well, this idea of creating a beautiful space and just everything that goes into that. Andrea: Right, but then neither of us ended up majoring in anything having to do with that. But then somehow we’ve kind of found our way back to that thing we were ultimately passionate about. So that’s pretty cool. Doug: Yeah, and we got into real estate investing, as we’ve mentioned on this podcast before, for the long-term goals of cash flow. Rentals, having that be our income someday is sort of our retirement. And that still has been our bottom line, ultimate goal, but yet the flipping houses portion of it we actually love doing. And I think we will continue in some fashion or another to build or rehab houses even long after we need to do this for income because we enjoy it. Andrea: Yeah, it is so fun to watch the transformation. It’s really, really exciting if you’ve ever had the opportunity, even if someone’s own home, to update your bathroom or whatever it is you might do. It’s so fun. Doug: It’s gratifying too. It’s gratifying to take something that was “ugly, or broken, or dated” and transform that into something that is an enjoyable place to be in, an enjoyable space that looks beautiful now. So, it’s fun. And we’re going to talk today, we sidetracked a little bit, but we’re going to talk about those contractors that can help you do this. Andrea: Yes, because they can make it extra fun or they can make it extra terrible. Doug: Stressful. So I guess we’ll go ahead and dive right into it, eight tips on dealing with contractors. But I guess first maybe we should talk about where you find contractors. Andrea: There are a lot of different ways to find contractors. The thing that we put the most weight on is a referral from somebody that we respect, another investor. Sometimes they don’t want to give up their contractor if they’re keeping that person really busy, and so we totally respect that. But if you can get a referral from somebody else that’s doing this business and doing well, they can give you feedback on someone’s work, and how they are to work with, and their communication style and all that. Andrea: Yeah, that’s a big deal. Doug: So referrals being number one. Another good way is, I think, just to drive around the neighborhoods you are looking to purchase in and look for some construction projects going on. Andrea: We’ve actually gotten a good painter that way, a good trash haul out company that way. They just happened to be doing a house on that street, and we got their card. We could tell they were doing a good time. Doug: Exactly. Yeah, go get their cards. Ask to talk to the boss guy, and you can find good people that way. Andrea: And then another way of course is all of the online sources that there are. So there’s Craigslist, and Angie’s List, and Yelp. Actually I kind of like Yelp because you have a lot of really good and honest reviews on there generally. If you go with Craigslist, you’ll probably want to get referrals from those people and call on their referrals to check up on them. Doug: Yeah those are good ways. Another way that I’ve heard taught is that you can go into Home Depot or Lowe’s, preferably in the morning time, and then just go to the Pro-desk, and you’ll see a lot of contractors coming in there and buying materials. So you could just talk to them there, get their card, or you could talk to the people at the Pro-desk and say, “Hey, who are the guys that are always buying a lot of materials here that you would recommend?” And maybe they’ll refer you to some people, so that’s another way. Once you find your contractors, you need to know how to work with them. Andrea: Right, and so we have come up with these— basically eight of our best tips for working with contractors. And when we first got started in this business, we got a referral from another investor for a really great contractor, and we loved him. We worked with him for a few years exclusively. It was a great relationship. Then he actually moved to Arizona to do business out there, and so we parted ways very amicably, and we got another referral from another investor that we trusted for a contractor. Entered into a great relationship with this guy as well, and we worked with him for about four year. And so we got to a point with this contractor who we used for basically everything. We really trusted him, and we kind of loosened up on our rules a ton, and it ended up ultimately biting us in the backside in the end because he got in over his head working for too many people. I’m not exactly sure what went down with him but for whatever reason, he filed bankruptcy and kind of left us high and dry. So it forced us to go back and realize, okay, how could we have foreseen that coming a little bit quicker? And what can we do to ensure something like this never happens to us again? So we were back to square one finding new contractors, which we did. We decided to, instead of putting all of our eggs in one basket, work with a few different contractors. It just makes a lot of sense, and it’s one way we know we wont’ get in that situation again. If somebody starts to go awry, you can kick him off the job and have somebody else to plug right into his place. Doug: And then you’re not overwhelming any one contractor with just too much work, and that was one of our problems with this guy. Andrea: Yeah, we really overloaded him with probably too much. And that’s our bad; that was something that we should have recognized sooner. So basically last fall we had to sit down and realize, okay how can we do this better? And these are the things that we came up with. So the first thing, it’s not one of the eight points, but the first thing is that for every job, especially before you have people that you know— once you have people that you know and love, you might not be getting a whole bunch of bids for every job— but when you’re first starting out, you want to get three bids for every job. Doug: Yep, three bids. Three different opinions. Doug: And you’ve heard this from other people before I’m sure, but it makes sense to get three different opinions. Not just to see if you can go with the lowest price guy, but to get a feel for these people and how they’re going to communicate with you, what kind of detailed bid are they going to give you. How quickly are they in getting that bid to you in the first place? If it takes them a week to give you a bid, maybe that’s an indication of how long they’ll take to do other things, so you’re looking for different factors there. Andrea: Right, and you’re also letting them know that you’re getting bids from other people. So it kind of forces them to be a little competitive with their price because they know that they don’t for sure have this job. Doug: Right, yeah. So once you have all of that, what’s your tip number one? Andrea: Tip number one is have them sign a contract. And so when we were working with just one person, it wasn’t something that we did because we really trusted him. But from here on out, we’ve realized the importance of having a contract for every job, and that contract should include their estimated completion date. And maybe you’re going to offer a bonus for finishing on time. I think that’s a really good idea. Andrea: Yeah, and you also maybe want to have in there that you’re going to start deducting, say $50 a day, past the completion date. So if they don’t finish on time, then it’s going to start dinging them. Doug: Okay, yeah so I think make sure that their time is reasonable. They set that time. Andrea: Right. Always ask them to tell you first. Doug: A realistic time frame, so then they have penalties if they’re late and bonuses if they’re early. That’s good. Andrea: And you have to be reasonable with this because sometimes there are overages that come up or extra items that need to be fixed that were unforeseen that you didn’t know about, so you have to add that into the timeline. So you have to be reasonable with them with your expectation, but to have that kind of spelled out so you’re both on the same page. I think that’s really important. Doug: Okay, good. Another thing you want to get also is their license and insurance, definitely want to have a copy of that on file. Want to make sure they’re licensed. You don’t want to go down that road if anything were to happen in the future. You want to make sure they’re covered and have the proper insurance in place. Andrea: So keep that together with that contract so you’ve got everything for that contractor in one place. Doug: Yeah keep it on file. And I would say in the contract, the work agreement, make sure that you’re making it clear that you’re hiring them as a contractor not an employee. Andrea: Okay, so tip number two is to request a basic schedule of the timeline that you can hold them to. So in your contract they’ve given you a completion date, but it really serves you both well to ask them to lay out a scheduled timeline so that you know okay, I can expect the painting will be done by this date, and the kitchen cabinets should be in around here. So you can kind of gauge as you go along if you’re where you’re supposed to be, because you might not know until the last week that oh my goodness, we’re way behind schedule here, and I didn’t realize it because I didn’t see if we were hitting these markers along the way. So I feel like that’s really helpful to keep you on schedule. But also, if you’re new in this process and you don’t understand construction, you don’t know a lot about this stuff, it’s a great education. So they’re basically writing out for you the process; this is how it goes. So now you know that the sheet and sheer inspection has to take place before the drywall can go up, or whatever it may be. Doug: The order of things. Andrea: Yeah, the order of things and how they take place. It’s just a fantastic education if you’re not familiar with the process. Doug: Yeah, great. Number three. Andrea: Tip number three is to establish good communication from the get-go. So first of all, make sure that they know how you prefer to communicate, whatever that might be. Is it text messages? Is it phone calls? Is it through Podio or some other communication progress tracking system that you have found and like to use? there’s lots of them out there. I actually just starting using one that I really like called Asana. The jury is still out on that, so I don’t want to say 100 percent for sure I love it, but so far I really am liking it. There’s a version on your computer and then also on your phone, and you can communicate and send photos, and SKU numbers, and invoices, and everything you can track through this little program. Andrea: We did use Podio with our last contractor. It worked really well actually. I liked it quite a lot, but working with several different people in different jobs, this one is a little bit more customizable where I can, and maybe you’re going to tell me Podio is too, but I can assign certain contractors to certain jobs. And for me it’s just simpler. I’m kind of liking this one so far. Doug: If it works better, great. That’s what we want. Something that works for you and the contractors. Andrea: So any means of communication that you prefer to use, just make sure they know what that is and if there’s a good time of day they can best get a hold of you, or times you don’t want them to be calling you. Just make sure you establish that up front. Request progress photos, but don’t rely solely on these. Doug: Yes, this is one of the mistakes we made with a former contractor. Andrea: Right. People can submit photos to you of a bathtub that’s not even your bathtub. So I would say if somebody wants to submit photos to you and you like that, use that as a means of communication to know what’s going on that day, but don’t pay out draws for work that’s completed based on a photo. You’ve got to make sure that the eyeballs belonging to someone in your corporation have seen the work before you write them a check. Doug: Yeah, big good tip there. Andrea: And then one last little thing about communication: make sure that all change orders are in writing, so if they’re adding things to the budget, just make sure that they put that in writing somewhere so that you’re both clear on it. Make sure that you’re getting invoices and receipts for money that you’re paying them, and just track all of that stuff accordingly. Andrea: Tip number four is the fact that getting permits and working with the city almost always doubles your time frame. Doug: You might even say triples in some instances. Doug: If you’re going to be dealing with the city for permits, every city and municipality will be different of course, but I would add at least double your time maybe triple your expected time frame for completing that project. Andrea: Yeah, so just make sure that you’re working that into your budget, those extra holding costs because you can think you know what’s going to take place, and you probably don’t know what’s going to take place. Even little things like what we’ve been experiencing on this historical project, the engineer architect drew up his plans accordingly, but then when you go and start tearing into the roof, seeing what’s actually in there, and realizing how many things don’t actually meet today’s code, he’s made so many changes. And then you have to wait for him to make those changes. Then you have to submit those changes to the city and wait for them to approve those changes, and meanwhile your guys are sitting on the sidelines twiddling their thumbs. And so, just know that it adds a little bit of time. This historical project is kind of a double whammy for us because we have to abide by every single thing that the city is telling us, and then we also have to abide by everything the historical society is telling us to do. And some of the things that they both want are contradictory to each other. So the historical society wants us to keep the original wood framed windows. Well they’re single-pane, they don’t meet the Title 24 requirements for energy efficiency according to the city, so the city wants all new windows. The historical society is really fighting us on that, and they do not want new windows. They want the original windows refurbished, so I think we’ve kind of found a way to figure out how to do that. We’ve got this window refurbishing expert guy working on it and figuring out how he can make that work. But it adds extra challenges and time, just the time to figure out what we’re going to do here to satisfy both sides. Doug: So in this instance we’re dealing with two municipalities that are governing the rehab, and you may have similar things if you’re dealing with a Homeowner’s Association. They’re going to fight for what they want, and they only meet once a month. There are just delays that can be expected, so just count on that. Andrea: Tip number five, and this is just a new little thing I’ve started doing, and I think it’s a great idea: keep a project journal. So in your project journal, it can just be little note column in your iPhone if you want or you can actually have a notebook. Doug: Or maybe an app in your Podio system. Andrea: Or maybe an app in your Podio system. But there you can write down ideas that you have, maybe design ideas or things you’ve discussed with the contractor. For me as the project manager, I constantly, for all of these different jobs, have all of these things swirling around in my brain. So to get them out of my head and down on paper just makes me feel so much more at peace and in control, and I know what’s going on, and I’m not forgetting things because I’m jotting them down and remembering that oh yeah, he told me the new roof shingles were going to be delivered on Tuesday, so that’s in my journal here. I see that, so I’m going to text him and make sure that did happen. Whatever the case may be, you can record change orders or draws that have been paid for easy reference. It’s right there. You can, without having to call your bookkeeper and say, “Hey, which draw number are we on for this project?” You can easily access that. I suppose that could be in your Asana app as well. So however you want to do that, just in some form or fashion, keep a basic journal of these different projects. And then also, you can document things that went great with that project and things that you would want to change the next time. I didn’t like the way we did this. I don’t want to ever do that again. Or hey, I loved the paint combination, the color combination that we used on the exterior of this house, so let’s keep that and duplicate it. You don’t have to go back and find it somewhere, you’ve got it written down. Doug: That’s where I think the huge value is because you’re going to come across, let’s say a project two years from now that will have something similar to a house you’re working on now. And you’ll be like I remember we dealt with this, or we had something very similar, or this was a lot like this project. How did we deal with that? I liked that one; let’s go back and reference it. You have all of that written down in your journal. Andrea: So tip number six is, and I kind of touched on this already, but inspect their work at least weekly. If you live in the same town and you’re not managing a whole bunch of projects, you may want to inspect it twice a week. But I would say at least weekly. For us, I typically drive out to all of our properties on either Thursday or Friday. So if you show up on Thursday and realize nothing has been done all week, you’ve lost a whole week. So if you showed up on Tuesday and on Thursday, you would have already realized on Tuesday that nothing is taking place, and you can kind of call people on the carpet. For us, it doesn’t really make sense because we have so many things going on. I’m only able to do it one day a week, but also we’re working with people that we trust, and I know that the work is getting taken care of. Doug: But even the once a week is, when we had gotten loose so to speak with the other contractor, we would go two, three weeks without seeing a project. Andrea: So I think bare bones minimum, it should be one week. And so when you’re there each week, be sure that you are kind of checking over all of their work. If you’re working from a set of plans that you have, then double check that the windows are where they’re supposed to be. Have a tape measure with you. Is the plumbing set up where it’s supposed to be? Are the can lights being laid out where they’re supposed to be? So you can make these changes if something is wrong before the drywall has gone in, before it’s become a really big challenge. Doug: Don’t just assume that they’ve got all that handled, that they’re going to have it correct because I mean, everyone is human here and mistakes can be made, and things can be overlooked. Andrea: Right, and they’re hiring subs too. This is all assuming that you’re working with a general contractor, but let’s say they have subs. Maybe their subs don’t know how to read the plans as well as they do, and it happens that people put things in the wrong places. So you need to kind of learn how to read the plans yourself and keep an eye on all of that. Doug: Great, alright number seven. Andrea: Number seven is only pay for work that has been completed. Doug: Hallelujah. Amen. We live by this one now. Andrea: Yeah we do. If they’re running a business that is good, and they’re doing a good job of running their contracting business, then they should be able to front the money to get started. You shouldn’t have to write a big check for them to get started on work that they have not done yet. That being said, there are a few guys for smaller, kind of sub-out jobs that we use— for example, our HVAC guy— he always needs half to get started to buy the equipment and things. We know him; we’ve worked with him a lot; we trust him. If for some reason he takes off, well that was $1,500. That’s not going to kill us. For him, we will do that. But for a main contractor, you’re not going to through it on $10,000 for them to get started. Do not do that. Doug: Especially if you’ve never worked with the person. Do not do that from the get-go. Andrea: We basically kind of let them know that we’ll pay them every Friday. So we’ll come out and verify the work. If it’s been done, you get paid every Friday. Doug: Yeah and you know, this might be a little bit extra work for you, and that’s where my mind goes. I like to make things simple, and let’s just keep it simple and not have to go out there so many times. But really when it comes to this, you’re dealing with a lot of money on these rehabs and accountability with the people you’re working with. So it is very important. Andrea: Right, and if you don’t want to do it. Let’s say you’re scaling your business to be really, really large, and you feel like you don’t have time for this, it’s an essential job. So you need to hire somebody else to do it. It doesn’t have to be you; I suppose if you don’t want to, or you don’t understand this stuff, or you don’t like it, but somebody in your corporation needs to be in the project management role. Doug: Yep, for sure. Okay, so now for the final tip, number eight. Andrea: Tip number eight is be reasonable and treat them with respect, treat them well. Contractors, they’re human too; they make mistakes. So try to determine what’s a mistake and what is maybe negligent or cause for firing. We had a contractor recently that laid backsplash tile sideways. Actually, it was one of the subs. Well you know what, it was done. I didn’t make him fix it because I didn’t spell that out anywhere. To me, it was obvious which way the tile was supposed to go, but to him it wasn’t. So you know what, that was my bad. The more clearly you can communicate your expectations, the better. And if you don’t, you’ve got to take responsibility for that. You want them to want to work for you. I don’t know if it’s the same way nationally right now as it is in Southern California, but contractors have a lot of work right now. It wasn’t like that a couple of years ago. They were desperate for any job you could give them. Well they have a lot of options right now, and so I want them to want to work for me when I call. So compliment their work. They do generally take pride in their work, and they want you to like it. So tell them, “Hey, that looks great. You did a great job.” Maybe bring them a cold drink on a hot day. Just little small things like that. Andrea: Bringing a container of cold water, small things go a long way to make them feel like you value what they’re doing. It’s a big deal. And then make sure other little small things. Make sure the utilities are on for them to use the restroom and if they’re not, for some reason the plumbing isn’t connected, order a Porta-Potty so they don’t have to leave. For one thing, that’s just a productivity issue. If they’re constantly leaving to run to Wendy’s to go to the bathroom, it’s slowing everything down. So make sure that they can use the restroom. It’s just one of those things that people don’t really think about, but it’s important. It’s just a nice gesture for them, and it’s a productivity issue for you as well. Doug: Yeah, yeah great tips. So now you have everything you need to know about working with contractors. I hope this helped. This system and these points that you’ve laid out here have really helped us in dealing with different subs and different contractors. Andrea: It’s really been revolutionary. I think as I’ve stepped into this role of project management to just have something clearly spelled out to myself, a way to track and communicate with people, and stay on top of things. It’s been really, really important, so I hope that this is helpful to somebody else as well. Doug: And like I said, it’s a big part of flipping a house. This is a huge chunk and can really make your life easier if you set it up from the beginning the right way, and go about the process, communication, and everything like that with your contractors correctly. Otherwise, it’s just going to be a stress, and a headache, and can cause problems. And you want to make sure you have a good grip on this whole process. Andrea: Our goal as business owners is to systemize things, and make things simple, and flow smoothly, and so in something like this with construction and renovation, there are so many unknowns and uncertainty. So the more you can systemize and streamline things to make getting over those hurdles and bumps in the road smoother, the better it’s going to be for everybody. Doug: Yeah, and don’t be afraid of it. It can be done, and it’s just a matter of getting out there, doing it, and kind of figuring it out as you go as well. But these tips will definitely help you in that process. So that’s it for today, and we will talk to you next week! Andrea: Talk to you later! Great article Guys! I think this is useful to rental owners as well. I saw you had one episode on the subject. DO you expect to have more? Yeah, well said! These are the important things one must aware about to make the life just a little bit easier during projects handling. Thanks for sharing this kind of post on web! Episode 32 is really helpful where discuss about Working With Contractors. I am great fan of this great flipping resourceful site. Thanks for your educative articles, hope we will get another helpful episode like this. Great point on keeping several contractors in your back pocket just in case something goes wrong. The smaller the contractor, the less work they can handle. Even if 10 projects go smoothly, something can fail on the 11th. That is when having someone else you trust available becomes a money saver in the long run.